America's Doctor Dr Oz says "the ancient Chinese technique of Qigong is a great way tap into our natural energy and combat the aging process". DEEPAK CHOPRA, MD renowned healer says ...Like Yoga, Qigong teaches you to balance energy in your body. Incorporate the health benefits of Qigong into your daily life." Deepak Chopra, M.D. ﻿Previously a secret technique the amazing power of qigong was gifted to only a few advanced people. QIGONG is an activity similar to Tai Chi. Qigong combines gentle movements, breathing, concentration and visualization “to obtain and maintain a healthy body, mind, spirit and emotional energy. Anybody can do Qigong and feel revitalised and relaxed in a few minutes. Super Power and Strength takes knowledge and somewhat longer. In Adelaide Australia World Tai Chi and Qigong day is celebrated at the South Terrace Parklands, near Pulteney St and Himeji Gardens. Everybody can be involved www.taichi.com.au for details. Based in New York City Qigong Master ROBERT PENG has taught hundreds of thousands of people of all ages. Some of his enthusiastic students and patients include..
RUPERT MURDOCH - Chairman and CEO of Newscorp and 21st Century Fox (sometimes called the worlds most powerful man). "A great Qigong Master, Robert Peng enlivened the famous life enhancing art of Qi to the United States and Australia, both as practitioner and teacher. I have learnt a huge amount from him". Henry Kissinger former Head of State.. To Robert Peng who is helping me keep straight. Good Work! "Robert’s Qi helped save my life. But he does something more important than heal, he teaches you to heal yourself. I am very fortunate to have found him". 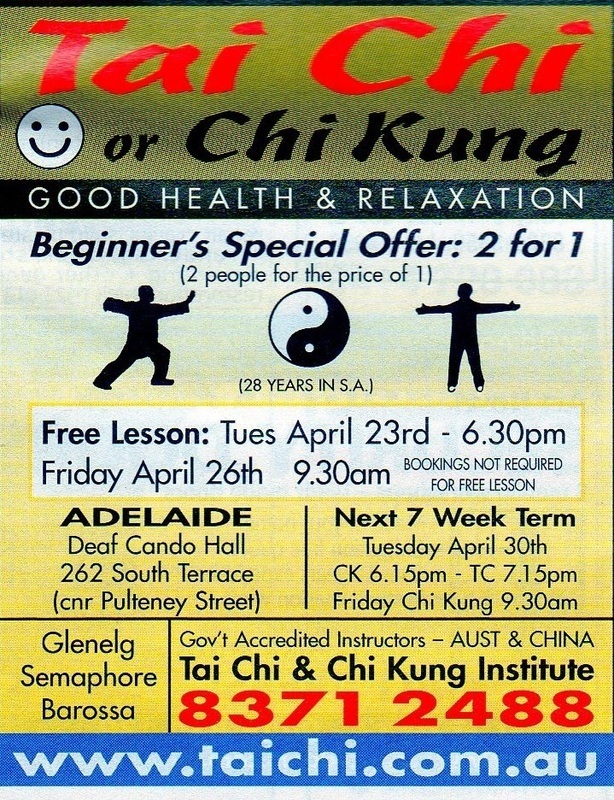 The TAI CHI & Chi Kung Institute holds Qigong and Tai Chi classes throughout Adelaide. Many high quality books, DVDs. Qigong is the SECRET KNOWLEDGE of healing and self empowerment. Knowledge is Power "Know Thyself". The ancient practice of qigong is a strengthening, powering, relaxing healing system that harmonizes the life force qi within the body and mind. Qigong will change your life and increase your feeling of being well and happy. Qigong will make you feel strong and give you the power of focus and strong will. QIGONG means in Chinese .... QI means energy or Life Force. GONG means daily work or practice or consistent exercise. So QIGONG means working with and developing your inner energy and life force. Developing and circulating energy through the body. Qigong is similar in many respects to TAICHI and Taichi can be called a type of Qigong. "People generally experience the health benefits when practicing Qigong faster than when they practice Tai Chi. Many teachers recommend that people practice Qigong instead of Tai Chi to gain health benefits if time is an issue. However, practicing Tai Chi and Qigong at the same time is most beneficial." We recommend the Tai Chi & Chi Kung Institute www.taichi.com.au for Taichi and Qigong, Chi Kung, classes in Adelaide, AUSTRALIA. Also for books and DVD's. Qigong gently stretches and massages muscles and tendons and promotes circulation through joints and tissues with a very sophisticated and scientific pumping flowing motion. The more relaxed and focused on the body the greater the blood circulation effects you will get. The more focused and relaxed you are the more your mind becomes calm and strong. The more Qigong you do the more healing and empowerment you will receive. We recommend the Qigong Master Robert Peng at www.robertpeng.com . Master Peng has had hundreds of thousands of Qigong students, and patients, and enthusiastic testimonials from well known people such as RUPERT MURDOCH from Newscorp, Sally Jessie Raphael, Australian Prime Minister Bob Hawke, Super Model Naomi Campbell, a Miss World, and many others. Master Peng has extraordinary Qigong teachings one of which is the "twelve cycle empowerment" Qigong. This teaching and practice takes place over about 3 months at the end of which those who have continued the practice diligently often display unexpected powers. Even ladies of more than 60 years of age have demonstrated empowerments that astonish themselves and others. In this video you will see some of the exercises and empowerments. At the end of the video you will see a famous Russian billionaire doing his first challenges after the 3 months training. He is accompanied by his partner Naomi Campbell who is a keen Qigong follower and strong endorser of Robert Peng. Acupuncture and Qigong are both part of Chinese medicine. World Information Center for Acupuncture. qigong, an activity similar to tai chi. Qigong is Chinese for “energy work.” It combines gentle movements, breathing, concentration and visualization “to obtain and maintain a healthy body, mind, spirit and emotional energy. World T'ai Chi and Qigong Day is an annual event held since 1999. The event is held the last Saturday of April each year in 60 countries. 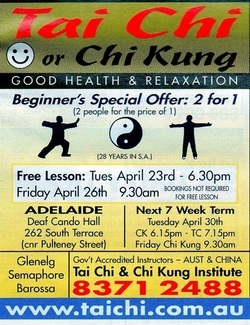 In Adelaide Australia World Tai Chi and Qigong day is celebrated ...see www.taichi.com.au for details. “As millions of people in China have already discovered, Qigong essentially reverses the aging process, while reducing stress, preventing illness, curing disease, and enhancing the overall quality of life." A randomized controlled trial by the University of Hong Kong Center on Behavioral Health, on Qigong exercise showed significant reduction in fatigue scores in patients with chronic fatigue syndrome. Qigong also led to significant improvement in mental and physical health and spiritual well-being Jessie S.M. Chan reported at the annual meeting of the Society of Behavioral Medicine.